Photo caption: Jeffrey M. Fried, FACHE, President and CEO of Beebe Medical Center and Paul Mylander, Chairman of Beebe Medical Foundation Board of Directors, thank Mike Fannin for his service and welcome Lacy Letonoff as the new chair of the Foundation’s Board of Ambassadors. 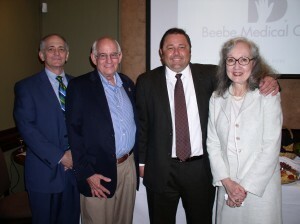 Beebe Medical Foundation’s Board of Ambassadors thanks Michael Fannin for serving as the founding chairman. Fannin, President and CEO of Country Life Homes in Milford, has led the organization since its inception in 2006. Lacy Letonoff, Investment Officer on the PNC Wealth Management team in Lewes, was installed as the new chairman. Letonoff has been a member of the Board of Ambassadors since 2006, and was event chair of Beebe Medical Foundation’s Best of the Beach Art Auction in 2010 and 2011. The Board of Ambassadors is comprised of 28 members of the community who serve as advocates and ambassadors for Beebe Medical Center programs and services. Board members learn about Beebe’s healthcare services through presentations by physicians and from taking behind-the-scenes tours of the hospital and outpatient facilities. In June of 2011, the Board of Ambassadors made a commitment to raise $100,000 for the Nursing Education Campaign, which supports the expansion of the Margaret H. Rollins School of Nursing at Beebe Medical Center. To date, the Board has raised more than $40,000, and has recently rolled out a new fundraising plan to reach this goal. Beebe Medical Center is fortunate to operate a nursing school that prepares nurses to meet the growing demands in our healthcare arena. Our country is expected to face a serious shortage of nurses in coming years as our population increases and as many nurses retire. To help ensure the continued availability of educated and experienced nurses, please support our Nursing Education Campaign. Contact Beebe Medical Foundation at 302-644-2900 for more information.